The Charming Andalucian Style Architecture Lends This Resort A Lovely Village Atmosphere With Shady Piazza Areas And Take In The Laidback Pace Of Life. The Beverly Hills Club Is Nestled On A Picturesque Hillside On The Edge Of Los Cristianos In What Is Known As The Oasis Del Sur Area. 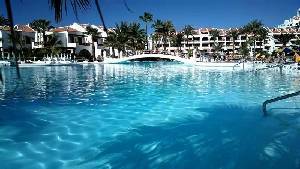 Complex Is Situated On The Border Of Playa De Las Americas & Los Cristianos, The Playa Las Vistas Beach & The Playa Del Camison Are Each Side Of This Complex. The Services Of The Coral Family Garden Compostela Beach Apartments Are The Ideal Complement For You To Combine Relaxation With The Family Entertainment. COSTA ADEJE GRAN Hotel, GF Hotels, can be found in one of the most privileged locations in the European continent, specifically in the south west of the Island of Tenerife, one of the Canary archipelagos which, given its geographical situation, enjoys the sun and warm, pleasant weather the whole year round, thanks to the swaying trade winds. Moreover, the geography of this beautiful Atlantic island creates inland micro-climates, areas like Costa Adeje, where the average temperature stays at 24 degrees Celsius / 75 degrees Fahrenheit and the air is clean and dry, favouring health and sports tourism. These beaches are bordered by a promenade that encircles them and favours sports like jogging and cycling, as well as a relaxing stroll or enjoying a coffee overlooking the sea. Two kilometres from the COSTA ADEJE GRAN Hotel we find the Magma Tenerife Congress Centre, one of the most emblematic modern works on the Canary islands, awarded with some of the most prominent architectural prizes and, with capacity for 2.500 people, is the meeting place for some of the best cultural events on the Island, along with the international congresses that it holds. 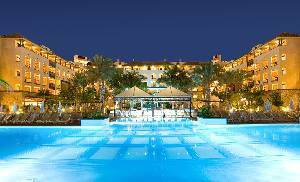 Likewise, you can also enjoy the other options offered by Costa Adeje, a setting endowed with large, protected natural spaces. You can also get to know the uniqueness of the rest of the Island, which has the third biggest volcano on Earth from its ocean base, Teide, World Heritage and 3.718 meters high. Or come and visit the city of La Laguna, also a World Heritage site, whose architecture takes us back to the time of the Conquista when the great European fortunes lived on the Island. If Youre After All Year Round Sunshine, Excellent Beach And Beach & Non-Beach Activities, And Golf Tenerife Is The Holiday Destination For You. The Modern Aparthotel Cordial Golf Plaza (Formerly Known As Golf Plaza Spa Resort) Is Situated On The Golf Del Sur, Southwest Tenerife. Vibrant green and quiet blue are the colours that surround the luxurious Hotel Cordial Golf Plaza located in the south of Tenerife, in the within the municipality San Miguel de Abona. Ideally situated within a short distance of Tenerifes popular golf courses, "Golf del Sur" and "Amarilla Golf" and at only 500m from the beach and the marina, guests will fin places for sport, relaxation and fun in this enchanting frame. The Property Enjoys Stunning Views Over The Amarilla Golf Course, And Also Overlooks The Ocean. We have 2 apartments in the same complex - a 2 bed, (3 terraces!) & a one bed penthouse with private roof terrace! Both with fantastic views and both sparkling, fresh and modern. We believe they provide some of the highest quality accommodation in the area. Each one has been really well furnished and we have been careful to make them as comfortable as possible for our guests.The complex has two pools (one heated), lifts, and Full English TV. At the front of the complex is a parade with a supermarket,and quiet restaurants. The picturesque resort centre is just a 10 minute walk away. The marina with it's lovely sea front restaurants is 5 min stroll. The complex of Ocean Golf and Country Club is one of the most prestigious in the resort of Golf Del Sur and these two apartment have the best positions within it. The swimming pools have been beautifully carved into the rock and provide a perfect spot to soak up the Tenerife sun. Plenty of sun beds are provided for your use. As the complex runs parallel to the golf course it is an ideal base for golfers but it is also perfect for those who want to relax and enjoy the Tenerife climate and the facilities that Golf Del Sur has to offer. At the front of the complex there is a supermarket, a lovely wine bar / tapas bar, and a couple of quiet bars restaurants. The marina is 5-10 minute walk away downhill where you will find a gorgeous sea front promenade full of bars and restaurants. There is also a small half sand / half shingle beach. A pleasant 10 minute walk will bring you to the picturesque resort centre which is based around a main square. Resort Information: Golf Del Sur is built around a 27-hole golf course and is well situated on the south coast. The streets are lined with sub-tropical palms and flowering plants which add to the charm of this high quality resort. Golf Del Sur has one night-club and a karaoke bar or the nightlife of Playa De Las Americas is only 15 euros away by taxi. As well as Golf, the resort has tennis courts, gymnasiums, crazy golf, and a bowling green. A bus stop is only 5 minutes walk. Buses run directly to Playa De Las Americas, Los Christianos, Los Abrigos and Santa Cruz - all where markets can be found. Golf Information: Golf Del Sur is an immaculately kept 27-hole championship golf course and runs adjacent to the complex. If you are planning to play more than once the golf club will look after your clubs and therefore you can walk to the 1st tee. (approx. 10 minutes walk). The golf club has a driving range, two putting greens, and a well-stocked pro shop. Golf lessons can also be booked. Just 10 Minutes Walk From The Commercial Centre Where You Will Find A Picturesque Square With Good Quality Restaurants, Bars And Shops. he Fishing Village Of Los Abrigos And Its Restaurants Are Only A 20min Walk Or 5min Drive Away. Take advantage of the year-round sunshine of Tenerife with a stay in this new apartment complex, surrounded by tropical gardens in the popular resort of Los Cristianos.Spend your day beside the Granada Parks 2 outdoor swimming pools whilst children play safely in their own pool or in the playground. You can also pamper yourselves with a massage or beauty treatment at the on-site wellness centre. 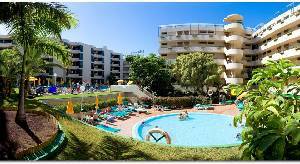 The Resort Is Ideally Located Right Next To Playa De Las Americas Golf Course. The Bars And Shops Of Playa De Las Americas Are A 20-Minute Walk Away And Theres A Free Shuttle Bus To And From The Golden Sands Of Playa Las Vistas. The Granada Park Is A Bright And Cheerful Complex, Perfect For All Ages, Especially For Keen Golf Enthusiasts. Situated 500 metres from Tenerifes Las Vistas Beach, this aparthotel offers 2 outdoor swimming pools, one heated in winter. The spacious, air-conditioned apartments have a private terrace and well-equipped kitchen. Hotel-Apartamentos Andorra is located in Playa de la Americas, just 450 metres from Las Amricas Golf Course. There are many shops, restaurants and lively bars within a 5-minute walk. A varied buffet breakfast is served in the Andorras restaurant. Snacks are available throughout the day at the poolside bar. Guests can also relax with a drink in the lounge bar. Exceptional Location, You Will Find A Vary Of Restaurants, Cinemas, Shows, Shopping Centers, Sports And Beaches In A 3-7 Minutes Walk. 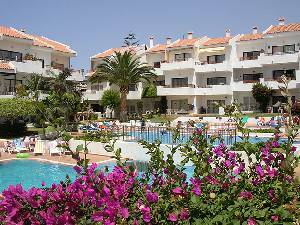 Located In Playa De La Americas, Just 450 Metres From Las Americas Golf Course. At Parque Santiago we reach the highest standards in hospitality creating a calm and comfortable family ambiance. The exquisite gastronomic offer along the whole resort and the unique solarium lead to the prime and excellence rank. Its highlight is the amazing commercial centre with 153 businesses which offer the best trademarks know on the market. The Unique Location Is Directly At The Sea Front Of The Golden Corner Of Playa De Las Americas. 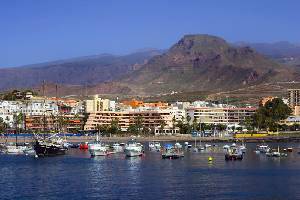 Saint George Lies Between Los Cristianos And Playa De Las Americas, 200 Metres From The Beach. It Has Lagoon-Style Swimming Pool. Each Apartment At Saint George Comes With A Private Balcony Or Terrace. They Are Equipped With A Kitchenette, A Safe And A Living Room Area. Guests Can Relax On Saint George's Large Sun Terrace. Cristian Sur is one of the most beautiful rental apartment complexes in Los Cristianos, in the South of Tenerife and its idyllic surroundings are only surpassed by the quality of our private apartments to rent. We have refurbished our rental apartments on Cristian Sur to a high standard, to provide you with the perfect holiday apartment 'home from home'. You will be completely relaxed, knowing that all your requirements are being catered for. Each apartment has its own separate kitchen, having all cooking facilities, 4 ring hobs, kettles, toasters, microwaves, fridge/freezers, washing machines, and a wide choice of cutlery, crockery and cooking implements. The lounges are very bright and spacious, dining tables and flat screen LCD T.V. 's with DVD and with British channels, BBC/ITV, Sky sports and movies, comfortable sofas, chairs, dressers. The bedrooms have built in wardrobes with hanging and shelved facilities and twin beds. Bathrooms have bath/shower or shower, W.C. and wash hand basin. Ample hot water is supplied by each apartments system. Off the lounge, each apartment has its own balcony, complete with patio furniture - Eating out at its best, with a great view of the pool, and perhaps a relaxing bottle of wine! All apartments have, safes, hairdryers, and cushions for the free sun beds around the pools. All apartments are non-smoking. The South Of Tenerifes Most Popular Location. A Relaxed Tranquil Holiday For All The Family. A 10 Minute Walk From The Town Center And The Beach Of Los Cristianos. 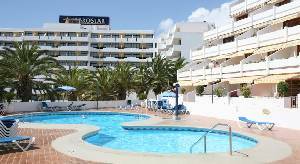 Ideally Located In A Quiet Area Of Los Cristianos Only A Short Walk From The Beaches An Historical Centre Of Los Cristianos. 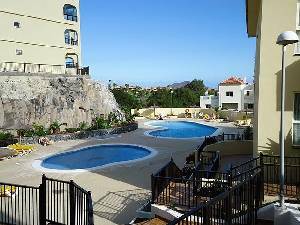 San Marino Holidays family apartment resort South Tenerife consists of one bedroom apartments for rent, two bedroom apartments for rent, and studio rental. San Marino is a terrific holiday complex. On site there is an Italian Restaurant, a Tapas Bar, and a fantastic bar called INKSPOTS offering great entertainment for old & young, as well as snacks. There are 3 pools, one specifically for children, another which is heated in the winter and one other. There is an onsite lifeguard for your added holiday safety. Also for your added security there is a complex night security guard. Tenerife has a wonderfully warm climate all year, that makes it the ideal family destination no matter when you wish to travel but with our special seasonal reductions from April, May & June, excluding Easter, it makes superb value. The family complex apartments are registered with "Turismo" and comply with all legal requirements. San Marino Is Situated On The Flat Area Of Los Cristianos In Tenerife And Not On The Hilly Area, Important If You Have Difficulty With Walking Or Children. 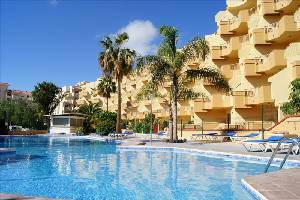 Las Americas Is One Of The Most Popular Town In Tenerife South With Increfible Great Beaches. Situated in Playa De Las Americas, a 5-minute walk from Puerto Colon Beach, Garden City features 2 shared pools with sun loungers and a poolside bar with flat-screen TV. Stunning one bed room apartments. Refurbished to the highest standards ensuring your comfort. With beautiful sea views from the sunny terrace you'll be able to watch the sun go down. Double glazed patio doors, shutters and a remote controlled ceiling fan will enable you to keep cool. A modern, fully equipped kitchen means you don't have to go out every night. Some apartments feature a private terrace and all of them have an open-space living and dining area with a TV and fan. The cooking corner includes a microwave, fridge, and kettle. Each apartment or studio has a private bathroom with a bathtub. Wi-Fi is available in public area at an extra charge. Washing machines and tumble dryers are available at the reception and carry a surcharge. The property also offers car rental services. You Can Play In The Snow Then Come Back To The South And Swim In The Sea. The Loro Parque - The World Famous Parrot Park With All Its Other Animals Including A Special Penguin House, Shark Tunnel, Tigers Etc. Garden City Is Surrounded By Restaurants, Pubs, Clubs And Bars. Imagine a holiday resort that is 100 metres from the ocean, adjacent to 27 holes of championship golf, has mountains for a backdrop and is set on one of the sunniest islands in Europe - Tenerifes Royal Park Albatros is that resort. In a peaceful residential area on the beautiful south of the Island, Royal Park Albatros offers 160 self-catering apartments clustered around a large outdoor swimming pool with cascading rocky waterfall and immaculate tropical gardens. 100 Metres From The Ocean. Adjacent To 27 Holes Of Championship Golf. Winner of Prestigious 2013 Trip Advisor Certificate of Excellence. Hotel Adonis Isla Bonita offers elegantly decorated bedrooms. This property is located on Playa Fanabe in Costa Adeje, one of the most popular parts of Tenerife. The hotel can be found at only 300m from the beach. Hotel Adonis Isla Bonita has been renovated and offers all modern comforts. The bedrooms feature a desk, spacious living room with sofa bed and fully equipped bathroom. They are equipped with direct phone, satellite TV and air conditioning. Isla Bonita Is 1.5 Km From Siam Water Park. The Complexs 24-Hour Reception Can Arrange Car Rental And Provide Information About The Island. For An Aperitif Or A Night Cap, There Is The Plaza Bar In Summer. In Winter, Acuario Disco Bar Offers Shows, Live Music And Contests. 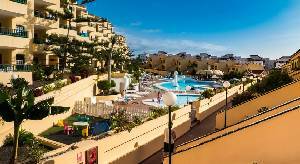 Laguna Park I is ideally located in the bustling holiday resort of San Eugenio in Costa Adeje and is a popular choice for families and couples. The Resort is located west of Tenerife's famous Playa de las Americas and within easy driving distance of the Veronicas strip's nightlife. Costa Adeje is a resort community that combines the best of both worlds. It's close to some of the Canary Islands' hottest action, yet far enough away that your sleep won't be interrupted by round the clock partying. The hotel is ideally situated 50 metres from the resort centre, where you'll find plenty of great shops and a convenient supermarket. Spend your days chilling out in the pool and on the terrace, enjoying superb views towards the sparkling sea.The complex has a large seawater swimming pool and a separate children's pool with a lifeguard in attendance; a poolside bar, snack bar, full restaurant and a self service launderette. The interior decoration of the complex is tasteful and uncomplicated. There is an intimate restaurant and a disco-style bar. 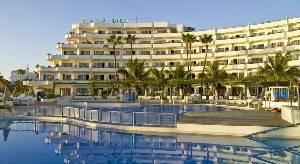 Laguna Park I also offers a large entertainment area with 5 flat screen TV's and evening family entertainment, and with 24hr English speaking reception staff and 24hr security guests can be assured of a relaxing and fun holiday in Tenerife. HOVIMA Jardn Caleta is located beside "La Enramada" beach and near "Playa del Duque" beach. Due to its situation, it is an excellent option for some relaxed holidays without having to give up the fun. Ideal for family or couple holidays, and for athletes or golf players that may use the sports centers nearby. All the apartments of HOVIMA Jardin Caleta have: fully equipped open plan kitchen, big lounge and separate bedroom (ideal for families), bathroom with bathtub, hairdryer, telephone, safe-deposit box (with charge), satellite TV, balcony or terrace, most of the apartments have sea or pool view and some of the units (studios) are disabled friendly (upon availability).The Sports and Leisure Center "Tenerife Top Training" is located next to the hotel. This center offers a wide variety of sports options. We invite you to visit their website and to know it better. The many services offered by the HOVIMA Jardin Caleta include the ability to change money, rent a car, book a tour or whatever you want, and enjoy a varied buffet in our restaurant for both breakfast and dinner. Our staff is at your disposal to help and advise in Spanish, English, German or French. Daytime and evening entertainment, daytime activities and entertainment, sports and regular evening program. Special care for children with special animation, mini club, mini disco and many games. The Apartmentos Playa Olid Complex is the ideal place to enjoy a complete holiday and enjoy an unforgettable stay in the exclusive area of Costa Adeje on the island of Tenerife. It has a prime location in the urban area, just 700 m from the Faabe beach and next to shopping malls, with many sport and leisure opportunities by its proximity to two golf courses, marina, and water parks. Guests can stay in fully equipped and conditioned apartments and studio apartments, furnished with the necessary infrastructure of a facility of such category. 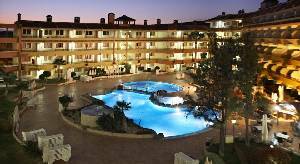 Apartamentos Playa Olid offers complete full services such as free Wi-Fi in public areas, swimming pools for adults and children, solarium, ballroom, gardens and a full restaurant service. A customer service team will assist you personally and provide tourist information about the area and tickets sale to major tourist attractions in the island. Costa Adeje Is A More Peaceful Resort Which Offers Spectacular Views Of Gomera Island And Mount Teide. The Hotel ISABEL is located on the Costa Adeje, the par excellence tourist enclave in the south of the Island of Tenerife, which forms part of the Canary archipelago, amongst its bonanzas it has a warm, pleasant climate all year long with an average temperature of 24 degrees, which has turned this Island into, especially in the Adeje municipality, the place chosen by millions of people throughout the world to enjoy their holidays. Staying at the Hotel ISABEL is about getting to know a new concept in holidays, tourism and tranquility as the establishment is organised like a typical Canary village, with its houses, streets, fountains and relaxation areas. It is so unique and pleasant that the guests stroll through the hotel streets as if it were a childhood village. Therefore, we invite you to get to know about the different accommodation we can offer in this little village with its warm weather and pleasant atmosphere. The Hotel ISABEL was built in 2001 and renovated in 2010, it offers 384 accommodation units made up of apartments, bungalows and villas, and it is designed for holiday-making for couples, groups of friends and families. The exceptional location of HOVIMA La Pinta, in Costa Adeje - Tenerife, makes it a perfect place to enjoy a few days of adventure or relax and a departure point from which to explore from North to South the island of Tenerife. Situated on the edge of the Atlantic Ocean, on the beachfront and in the "Puerto Deportivo Coln" marina. HOVIMA La Pinta has numerous 1 and 2 bedroom apartments, all of them really spacious for you to feel at home. All the apartments of HOVIMA La Pinta have: open plan kitchen, separate room and lounge, air conditioning in the lounge, bathroom with a bathtub, hairdryer, safe-deposit box (with charge), satellite TV, terrace and most of the units with sea or pool view. Day-time and night-time entertainment with shows, live music and special attention to children. Reception ant attentions on arrival. We also have a baby sitter service available, please ask for it on arrival. This Modern Hotel Enjoys A Stunning Setting On The Mesmerising Island Of Tenerife. The Hotel FAAB Costa Sur**** is located on the Costa Adeje, a privileged enclave in the south of the Island of Tenerife which, thanks to its geographical location, enjoys average temperatures of 24 degrees all year round, a gentle, pleasant breeze and clean, dry air, ideal for any person who wants to enjoy some unforgettable holidays, and highly recommended for health and sports tourism. Ideal for couples and family vacations in Tenerife.The HOVIMA Santa Mara in Costa Adeje , is situated in a special place of the Island of Tenerife, in a leisure and commercial area. From 300m of the beach and 350m of the harbor Coln. The HOVIMA Santa Mara has numerous studios, apartments and suites. Focus on children, with mini-club, mini-disco at night, specific animation for kids and many great games. The numerous services offered by the HOVIMA Santa Maria include possibility to change money, rent a car, book a excursion or anything else you want and enjoy a diverse buffet in our restaurant for both breakfast and dinner. Our staff will be there to help you in English, Spanish, German and French. A warm welcome will wait for you at the reception on arrival. You can ask for our babysitters (additional costs) at the reception desk. You can enjoy the sun by the pool, with deck chairs, parasols and pool air mattresses. Play tennis, table tennis, billiards, petanque, board games or participate in the animation program during the day and evening with shows, live music and a special programme for children with entertaining activities. 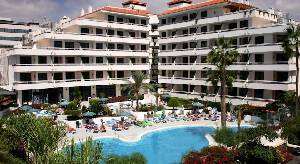 Located In The Costa Adeje Area Of Tenerife, Only 250 Metres From The Beach. The Bars, Shops And Restaurants In The Resort Are All Within Walking Distance Of The Santa Maria. The Right Choice For Couples And Families Looking ForHolidays To Tenerife With Comfortable Accommodations, Excellent Onsite Facilities And Close To The Beach. 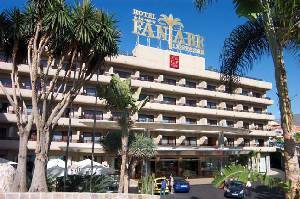 Welcome to Laguna Park II Aparthotel, located in Costa-Adeje to the south of Tenerife in Canary Island. Our resorts offers you the enjoyment of an unforgettable holiday in a friendly ambience. There is a daily bus to the centre and the beach of Las Americas. 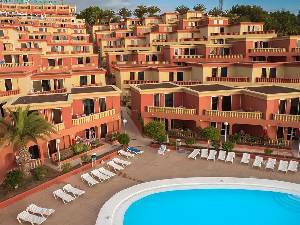 The Laguna Park II is a basic apartment complex situated in Costa Adeje, just 500 metres from Torviscas Beach. The apartment complex is located on a steep slope and is not recommended for guests with walking difficulties. 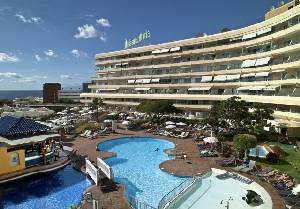 Popular with young guests the complex is situated 700 metres from the lively centre of Playa de las Americas and the complex provides a bus service to the resort centre and the beach. Situated on the Costa Adeje, in the south of Tenerife, the smart and modern Laguna Park 2 apartment complex has excellent on-site facilities, including an outdoor swimming pool. Spend the day sunbathing by the swimming pool. There the children can take a dip in the cool waters of the pool or play in the on-site games room. Laguna Park 2 Tenerife is located just a short walk from the beach, so after a wholesome breakfast in the morning, you can head down to the beach with all the family. 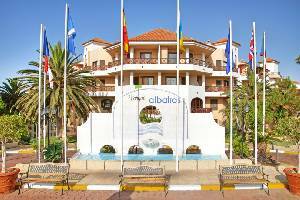 This Aparthotel Is Located In Adeje (Costa Adeje), Close To The Beach, Aqualand Costa Adeje, Bobo Beach, And Gran Sur Shopping Center. Castle Harbour offers an helpful and pleasant 24 hour reception service including , car hire, excursion ticket sales, safety deposit box rentals, fax service, internet access.. There is also a luggage room as well as showering facilities available for Guests to use on departure days. The swimming pool is large with a separate section for the children to enjoy and is surrounded by sun terraces, furnished with sun loungers and sun umbrellas (both payable locally). There is a life guard on duty on a daily basis. The El Paso poolside bar is open daily and serves the usual snacks and drinks, whilst its' adjoining restaurant is open every night serving a wide variety of international dishes. Here we have occasional evening entertainment on the terrace as well. Located in our beautifully maintained and luscious gardens, there is also a tennis court , equipment is available for rent at reception. We also have a couple of pool tables to add to your entertainment. The Castle Harbour Has A Calm, Homely And Friendly Atmosphere.